You know, just a few images of good guy Tommy Vercetti helping old ladies across the street. 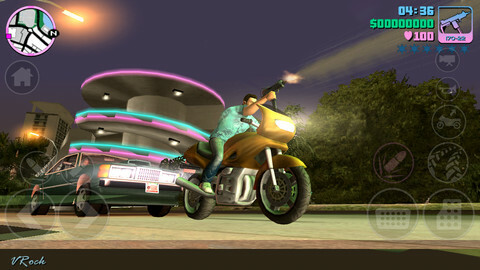 On Thursday, December 6, Rockstar will take iOS and Android gamers back to the future with a port of Grand Theft Auto: Vice City. For longtime fans, it'll give them a chance to bathe in 80s nostalgia once again, as they run amok with the game's anti-hero, Tommy Vercetti. For newcomers, well, they're in for a treat. That said, the publisher just released three screens of the mobile and tablet version in action. At first glance, everything appears to be the same, but look a bit closer. Notice the improved character models and environments. Then check out the two bullet icons directly above the virtual thumb stick, which were clearly designed to make drive-by shootings as simple as can be. We've always had a soft spot for GTA Vice City, and think it'll be even bigger than the GTA 3 re-release. Naturally, we'll have a review later this week. View the rest of the screens here.